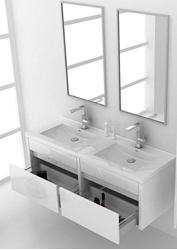 Novelli Luxurious WHITE Double Bathroom Cabinet / Vanity with 2 doors and 2 drawers, Ref KC138W. Size:1380 mm L x 475 mm D x 590 mm H In brilliant white gloss paint, walnut / oak/black finish. Optional Tall cabinet( wall), mixers and Mirrors.